salam guys, i want to know that is unique ud 125 is worth buying in Cinese 125cc category ??? Yes its worth buying but if you can find a used bike you can save around 20,000 Rs. thanks ! and what about engine performance ??? i know the rest of the bike quality will not up to the mark as honda. Honestly speaking I never rode UD-125 but I have seen one very closely, It was my freind's freind bike. It looks and sounds exactly the same. Infact in the owner's words this bike is faster than Honda bcoz it weighs less. You can get a decent a year or two old UD125 for around 50k. Thats really good value for money. Yep unique 125 is good choice. What about unique ud 100. Is it good for daily drive and what about maintenance and is it robust? Thinking of buying one, where should I look in Lahore? The ud 100 I need is the one with 5 spoke black rims not the wire spoke rims. The one with the alloys is the deluxe model. I think its a little over-priced. For that kind of money you can get a 125. UD-100 gives 50km/litre whereas 125 gives 45km/litre. both are equally reliable. UD-100 has a good resale value bcoz of its killer looks. Personally I would prefer a 125........choice is yours. Yeah it looks good but what do u mean by its overpriced. The cost on Pakwheels list was 50000 and I think that's justified since ud 70 is for 45000. But nowadays I can't find one in Lahore. Old ones are available and they sell for 45k but new aren't available anywhere. Do u know a place I could find it. Preferably in blue. This is the one I am looking for. Are they still being made since the last price check on the Pakwheels website is from 2012. Are there any trails or 150cc bikes other than this that have appealing looks. Are new still being made? Wow 75k is overpriced. I believe the Ex-factory is price is somewhere around 65-70K. The factory is in Hyderabad and yes they are making this model. This particular model is high in demand. In this price range you can get a SP-125 brand new. It cost 68k. Why dont you think of buying this. I think is a better option than UD100. Qingqi is coming up with a trail I believe. Launch date pata nahi. 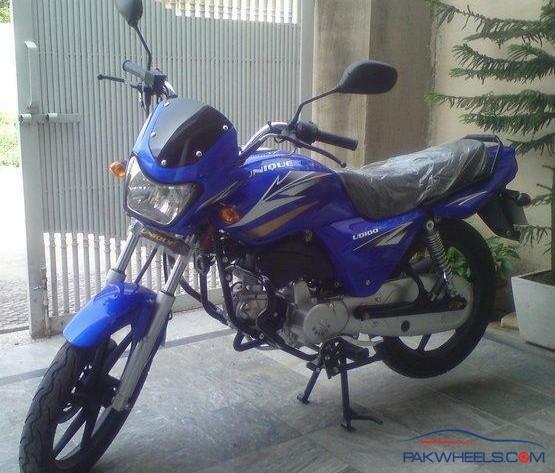 Yaar 100cc has better fuel economy and UD100s rims look good but the Super Power doesnt. SP125 has no resale.